Choose wall colors carefully. Different colors can help define separate areas, so select hues in the same tone family to create a seamless flow from one space to another. Furniture. If you have a country-style oak dining table, try to choose the same style furniture in your living room. Avoid anything that is too opposite, like ultra-modern minimalism in the living room and a country theme in the kitchen. 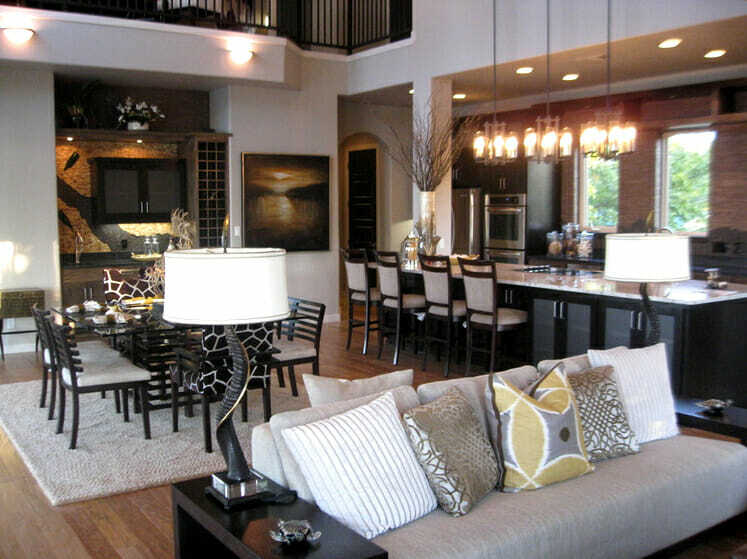 Try choosing the same wood, material, and style for each section of your open concept room. Window treatments. Make sure you use the same theme throughout, and that all of your windows look identical. Different shades, blinds, and curtains can create a big, big decorating mess. Accessorize. Tie in the accessories from your kitchen into your living room. If you have brown-hued granite countertops, pop a fuzzy throw in the same color family onto your couch. If you have a set of red-hot KitchenAid appliances on your counters, use the same red pillows on your couches. You can even connect your guest bath decor with a red towel or rug, or even a bouquet of red flowers to tie the look together. Throw in some wooden photo frames with photos of the family to personalize your space! Lighting. 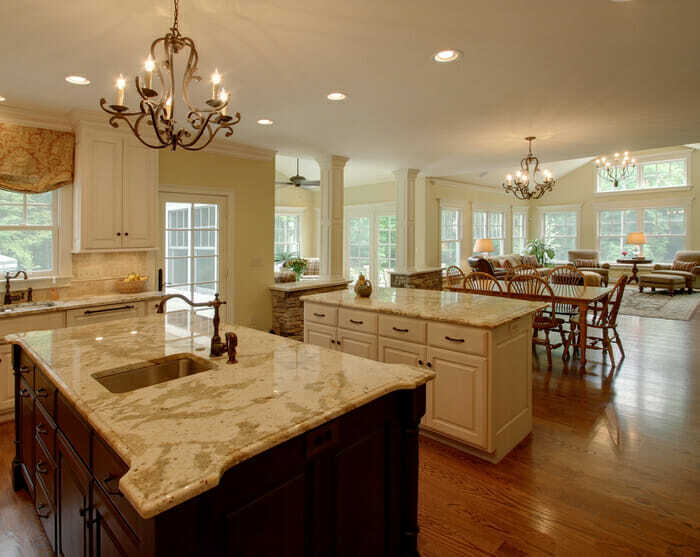 The correct lighting can define each space of your open-concept layout and help visually separate them. 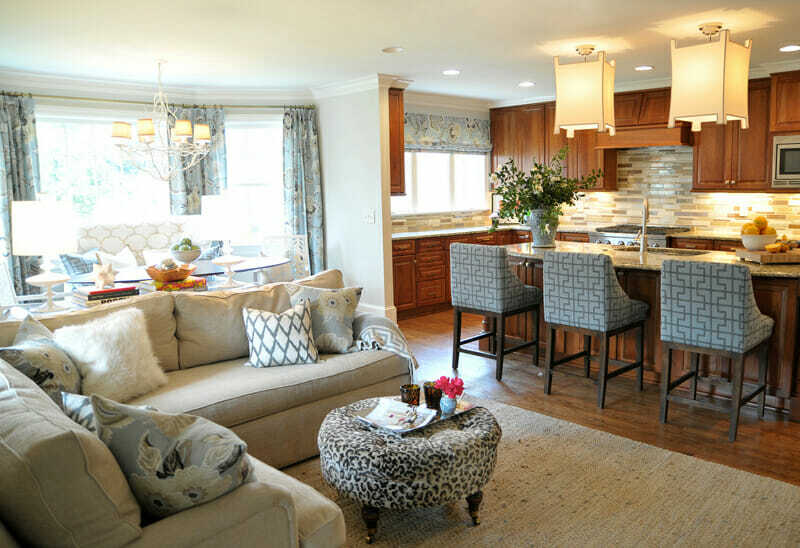 Floor lamps in the living room work well, while a pendant lamp in the kitchen blends in effortlessly.